A picture of a dozen lemons has gone viral on Facebook, and the simple information it provides could prove life-saving. It can strike at any time and anywhere, and a photo of a dozen lemons could help you spot it before it’s too late: breast cancer. 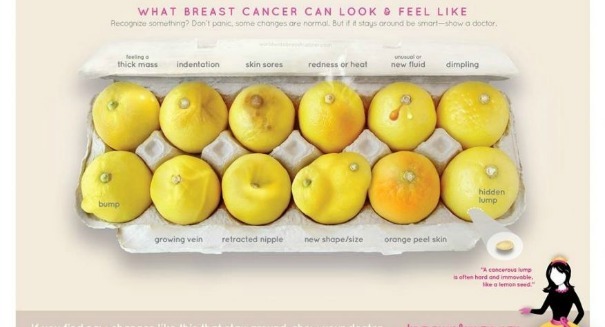 A breast cancer awareness campaign ad feature a dozen lemons exhibiting 12 key signs of breast cancer has gone viral after it was shared by a 38-year-old patient. Erin Smith Chieze found a similar image a couple years ago and said it saved her life after she used it to spot her own breast cancer, which was in stage 4 when she caught it. Since sharing it on Facebook on Jan. 10, it was shared more than 33,000 times. It’s part of the Wolrdwide Breast Cancer Organization’s Know Your Lemons campaign. Each of the lemons exhibit a different sign of breast cancer.